This was the official website for Democratic incumbant Ed Rendell's 2006 campaign for the governor of Pennsylvania against Lynn Swann, a former professional football player for the Pittsburgh. Ed Rendell won re-election as governor in 2006 by a landslide. He left office in 2011 due to term-limits, and released a book, A Nation of Wusses: How America's Leaders Lost the Guts to Make Us Great the following year. Edward G. Rendell was inaugurated as Pennsylvania’s 45th Governor on January 21, 2003. As Governor, Rendell serves as Chief Executive of the nation’s 6th most populous state and oversees a $22 billion budget. In Governor Rendell’s first term, Pennsylvania has rebounded sharply from the recession of the early 2000s. He has made unprecedented investments to revitalize communities across the commonwealth, improve education and expand the access to affordable prescription drugs for older Pennsylvanians. Today, these investments are paying off. There are more Pennsylvanians working than ever before, with more than 120,000 more people at work now than when Governor Rendell took office in January 2003. Pennsylvania now ranks 15th in the nation for job growth, up from 41st just four years ago. Importantly, our unemployment rate has fallen over a full point and continues to be below the national average. Under Governor Rendell, student achievement is on the rise at every grade level and in every subject. Pennsylvania’s public schools now have the resources to invest in proven education initiatives like pre-kindergarten, full-day kindergarten and tutoring. Almost 100 school districts are investing in class-size reduction in kindergarten through 3rd grade to benefit nearly 20,000 children. In his first year in office, Governor Rendell crafted a plan to increase the number of older Pennsylvanians to get the affordable prescription drugs they need through Pennsylvania’s PACE and PACENET programs. By this summer, more than 315,000 Pennsylvania seniors will be served – up 44 percent. Governor Rendell has done all of this while being a careful steward of the commonwealth’s finances. When he became Governor in January 2003, the commonwealth faced a projected budget deficit of $2.4 billion. As one of his first acts, Governor Rendell cut government spending to close that deficit and implemented programs and policies to apply business principles of productivity and cost-savings to the operation of state government. By the end of 2006, through developing new business practices and focusing on innovation and efficiency throughout the government, the cost of government has been cut by $1 billion. From 1992 through 1999, Governor Rendell served as the 121st Mayor of the City of Philadelphia. Among his many accomplishments as Mayor, Mr. Rendell eliminated a $250 million deficit; balanced the City's budget and generated five consecutive budget surpluses; reduced business and wage taxes for four consecutive years; implemented new revenue-generating initiatives, and dramatically improved services to the City's neighborhoods. The New York Times called the Philadelphia renaissance under Rendell “the most stunning turnaround in recent urban history.” Before serving as Mayor, Mr. Rendell was elected District Attorney of the City of Philadelphia for two terms from 1978 through 1985. The Governor, who served as General Chair of the Democratic National Committee during the 2000 Presidential election, has always been active in the community through a variety of memberships on boards and also teaches government and politics courses at the University of Pennsylvania. An Army veteran, the Governor is a graduate of the University of Pennsylvania (B.A. 1965) and Villanova Law School (J.D. 1968). He was born on January 5, 1944. The Governor and his wife, First Lady Marjorie O. Rendell, a Judge on the United States Court of Appeals for the Third Circuit, have one son, Jesse. They will celebrate their 35th wedding anniversary on July 10, 2006. The commonwealth is poised to become the largest state purchaser of renewable energy sources in the country, Gov. Ed Rendell said yesterday as he unveiled a new agreement with the state's electric supplier, Community Energy of Wayne, Delaware County. The agreement calls for 20 percent of electricity used by state government to come from renewable sources like wind and hydropower. That's twice as much as in the current contract. The change means a cost increase of less than 1 percent. The state currently spends about $70 million a year on electricity. Under the new agreement, that cost is expected to grow to $70.5 million, Environmental Protection Secretary Kathleen A. McGinty said yesterday at the DEP's Southeast Regional Office, where she and the governor unveiled the new contract. Gov. Ed Rendell said yesterday that he would not support an increase in the state gasoline tax to help raise $866 million to $2.2 billion to rebuild roads and bridges in Pennsylvania and get mass transit agencies in Pittsburgh and Philadelphia out of debt. Mr. Rendell said Pennsylvania already has the third-highest gasoline tax in the United States. "With gas averaging over $3 a gallon this past year, this is not the time to consider a gas tax increase," said the governor, who is seeking re-election. He would not say specifically how he would come up with the funding called for by the Pennsylvania Transportation and Funding Reform Commission. He said the state has found ways in the past "to stretch highway dollars" and would look to do so in future. But he added it would be unrealistic to expect the state to fill the gap without new sources of funding. He said that does not necessarily mean an increase in a tax or fees, given that the economy is doing well and generating surpluses for the state. He said another possible source of funding is the oil company franchise tax. The commission is expected to deliver a final report with recommendations on funding by Nov. 15, not coincidentally after the general election. Should Pennsylvania have the highest standards of public integrity in the nation? Swann: Yes, it is my commitment to the citizens of the Commonwealth that my administration will work in a way that guarantees open and transparent behavior. Lobbyist disclosure: require lobbyists to register and report spending to influence state government. Rendell: After the General Assembly failed to pass legislation on this important issue ... I (signed) an executive order requiring that those who lobby the Executive Branch register and report their lobbying expenditures. The General Assembly needs to follow suit by passing meaningful lobbyist disclosure that requires anyone who lobbies to register and complete itemized expenditure reports. These reports must identify who is lobbying, on what issues, how much they have spent to lobby, whether they have given any gifts to members, and, if so, how much and to whom. Swann: A lobbyist disclosure measure must indicate what is being spent by whom and there must be strong penalties for those who refuse to comply. Every document filed must be available for viewing on the Web. I will ensure that a strong lobbyist law is one of the first bills I sign. Rendell: We must also end permanent incumbency by introducing 8-year term limits for legislators which is consistent with the 8-year gubernatorial term limit. I believe that term limits will free legislators to vote their conscience on major issues facing the Commonwealth without worrying about the effect on their careers in the GA.
Swann: Does not mention in survey but supports. Rendell: It is essential to reform the process for drawing state legislative boundaries so that redistricting is conducted by a nonpartisan independent commission that can ensure that appropriate representation is the sole driving force behind the creation of legislative districts. HARRISBURG: The Pennsylvania State Building & Construction Trades Council has endorsed Governor Ed Rendell for another term. The Council is comprised of 121 affiliated local unions from 50 regional counties across the Commonwealth, which represents more than 100,000 working families. The Council endorsed the Governor earlier this week at their Annual Convention held at the Hilton Harrisburg. Governor Rendell addressed the group during their morning session. "I am proud and honored to receive the Pennsylvania State Building and Construction Trades Council endorsement. The Council is comprised of hard-working Pennsylvanians that contribute so much to our Commonwealth,” Governor Rendell said. “As governor, I will remain committed to revitalizing our communities and creating the jobs we need for a greater Pennsylvania. We will continue our progress and make the changes we need for today and for our children's tomorrow." The Governor’s $2.3 billion Economic Stimulus plan has led to the highest employment levels in Pennsylvania history and 125,000 more people are at work since Governor Rendell took office in January 2003. Pennsylvania is now ranked 15th in the nation for job growth – compared to 41st just four years ago. Governor Rendell also proposed, fought for and signed into law an increase in the minimum wage that will help 420,000 hard-working Pennsylvanians. It was the first hike in seven years. “After interviewing both candidates, there is no doubt that re-electing Ed Rendell will lead to more jobs for Pennsylvania workers,” said Frank Sirianni, President of Pennsylvania State Building & Construction Trades Council. Gov. Rendell Attends House Party Hosted by Campaign "Citizen Co-Chair"
PLYMOUTH MEETING: Yesterday, Governor Ed Rendell attended a house party hosted by “Citizen Co-Chair” Mark Levy in Plymouth Meeting, PA. About 100 Democrats, including State Senator Connie Williams, State Representative Mike Gerber, and Montgomery County Democratic Chair Marcel Groen, gathered to help support the Governor’s re-election campaign. “Citizen Co-Chairs” hosted house parties throughout the Commonwealth. Co-Chairs invited their friends and neighbors into their homes to encourage them to get involved in Governor Rendell’s re-election campaign. Speaking on a conference call among all house party hosts were “Citizen Co-Chairs” Valerie McDonald Roberts, Allegheny County Recorder of Deeds, Tom Furhman, Director of Lake Erie Conservancy, and Luzerne County Commissioner Todd Vonderhied. Each spoke of the policies and programs that have personally affected them, their families and their communities. “Governor Rendell has Pennsylvania moving in the right direction,” said Representative Gerber, “and deserves our vote so he can continue taking our Commonwealth down this very positive road. I am excited Governor Rendell chose to join us here in Montgomery County and in Plymouth Township for tonight's event. Patrick Murphy Joins "Veterans for Rendell"
Levittown – Patrick Murphy, former US Army Captain, Iraq War Veteran, and Democratic Nominee for Pennsylvania’s 8th District, joined veterans from all over southeastern Pennsylvania in endorsing Governor Ed Rendell for re-election. Speaking at the Joseph Schumacher VFW Post in Croyden, Patrick Murphy spoke on how Governor Rendell has consistently fought for Pennsylvania’s veterans, and deserves to be re-elected in November. PHILADELPHIA: The Pennsylvania Conference of Teamsters, the statewide Teamsters union, today endorsed Governor Rendell for another term. The Pennsylvania Conference of Teamsters consists of two (2) Joint Councils and 42 Local Unions located in Pennsylvania, Delaware, New Jersey and West Virginia. There are approximately 142,000 members of the Teamsters Union in Pennsylvania whose endorsement was received today. The organization's president, Frank Gillen, made the announcement today at an endorsement event held in Philadelphia. “I could not be prouder to once again receive the Teamsters’ endorsement. The men and women who get up for work every day and put in an honest day for an honest wage are the foundation of Pennsylvania,” Governor Rendell said. “As governor, I will remain committed to revitalizing our communities and creating the jobs we need for a greater Pennsylvania. We will continue our progress and make the changes we need for today and for our children's tomorrow." The Governor recently led a successful effort to increase the minimum wage to $7.15 an hour, a bill that will benefit approximately 423,000 low-wage earners in Pennsylvania. His $2.3 billion Economic Stimulus plan has led to the highest employment levels in Pennsylvania history and 125,000 more people are at work since Governor Rendell took office in January 2003. RENDELL’S RECORD OF ACCOMPLISHMENT? PRICELESS. PHILADELPHIA: Yesterday, Lynn Swann, the handpicked candidate of George W. Bush and Republican insiders in Harrisburg and Washington, DC, released a campaign book to counter criticisms he was unprepared to discuss key issues facing Pennsylvania. Swann, who reportedly charges as much as $150 for his autograph, is selling the campaign book for $10. Although even his own campaign acknowledges some key issues are not addressed in the book, Swann did find room to continue his pattern of harshly criticizing Governor Rendell. As the AP reported, “The 143-page paperback is laced with attacks on Rendell.” Swann has been caught repeatedly making misleading and factually false claims on the campaign trail while attacking the Governor. Protecting and preserving our environment through “Growing Greener II,” a $625 million bond issue that is already making needed investments. NORRISTOWN: Today, Governor Ed Rendell and Senate nominee Bob Casey received the endorsement of three leading environmental groups, the League of Conservation Voters, Clean Water Action and the Sierra Club at an 11:00 am press conference at the Montgomery County Courthouse in Norristown, PA. The endorsement also serves as the official kick-off of “Environmentalists for Rendell,” part of the Governor’s “Citizen Co-Chair” campaign. Clean Water Action (CWA), a national citizens organization dedicated to the maintenance of clean, safe and affordable water and prevention of health-threatening pollution, praised the Governor for his initiative to reduce mercury pollution. “Thanks to Governor Rendell,” Bob Wendelgass of CWA stated, “Pennsylvania is now a national leader in the battle against mercury pollution and one of the states setting the pace in protecting our kids against this toxic pollutant." Edward G. Rendell, Pennsylvania's 45th governor, was born in New York City on January 5, 1944, the son of Jesse T. Rendell and Emma Sloat. All four of his grandparents were immigrants from Russia. He married Marjorie Osterland Rendell in 1971. They have a son, Jesse. An Army veteran, Rendell graduated from the University of Pennsylvania (B.A. 1965) and Villanova Law School (J.D. 1968). From 1992 through 1999, Governor Rendell served as the 121st Mayor of the City of Philadelphia. Among his many accomplishments as Mayor, Rendell eliminated a $250 million deficit, balanced the city's budget and generated five consecutive budget surpluses, reduced business and wage taxes for four consecutive years, and dramatically improved services to the City's neighborhoods. Before serving as Mayor, Rendell was elected district attorney of the City of Philadelphia for two terms from 1978 through 1985. 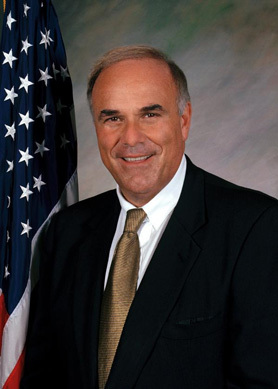 Rendell served as general chair of the Democratic National Committee during the 2000 Presidential election, has always been active in the community through a variety of memberships on boards, and also teaches government and politics courses at the University of Pennsylvania. Governor Rendell's unprecedented strategic investments energized Pennsylvania's economy, revitalized communities, improved education, protected the environment, expanded access to health care for all children, and provided affordable prescription drugs for older adults. He championed and signed into law Pennsylvania's first comprehensive measure to substantially reform the local tax system by providing urgently needed property tax relief to homeowners. During his tenure, taxpayers saved nearly $800 million in the first year of statewide property tax relief from gaming revenues. Governor Rendell sought to make government more responsible to the public by cutting wasteful spending and improving government efficiency to save more than $1 billion. He pursued a legislative agenda that included commonsense political reforms to put progress ahead of partisanship. Under Governor Rendell's leadership, Pennsylvania's economy rebounded sharply. Governor Rendell's economic stimulus plan invested more than $2.8 billion to create new jobs and revitalize communities. Under his administration, Pennsylvania ranked 15th in the nation for job growth, up from 41st at the beginning of Governor Rendell's first term. To ensure that all Pennsylvanians shared in the benefits of a growing economy, the Governor successfully championed the first minimum wage increase in nearly a decade. Under Governor Rendell, student achievement rose at every grade level and in every subject. The Governor invested in proven education initiatives like pre-kindergarten, full-day kindergarten and tutoring. Pennsylvania went from being one of just nine states in the country that failed to fund pre-kindergarten to a national leader in early childhood investment, and for the first time ever more than half of Pennsylvania kindergartners attended full-day programs. Governor Rendell also made Pennsylvania a leader in pursuing energy independence - creating jobs in the emerging alternative energy economy while developing effective strategies to reduce dependence on foreign oil and save families money. Governor Rendell championed a dramatic increase in the number of older Pennsylvanians who received affordable prescription drugs through Pennsylvania's PACE and PACENET programs. He also saved older adults thousands of dollars a year that they would have been forced to pay under the federal Medicare Part D prescription drug plan. In addition, Governor Rendell won passage of the landmark Growing Greener 2 environmental investment package. The $625 million initiative went to cleaning up rivers and streams, improving parks, returning abandoned industrial sites to productive use, protecting open space and preserving farmland. Governor Rendell accomplished all of this while being a careful steward of the commonwealth's finances. When he became Governor, the commonwealth faced a projected budget deficit of $2.4 billion. As one of his first acts, Governor Rendell cut government spending to close that deficit and implemented programs and policies to apply business principles of productivity and cost-savings to the operation of state government.